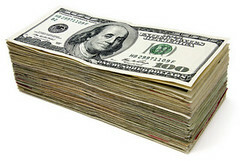 I’ve wanted to blog about our finances for a while (mentioned it here). Becoming debt free except for the mortgage is actually one of my 40 before 40 goals (#6!). Plus, I feel like if I’m out there, talking about it (even on the web) and thinking about it, it stops being this dirty little secret. Hopefully my journey will help others too. 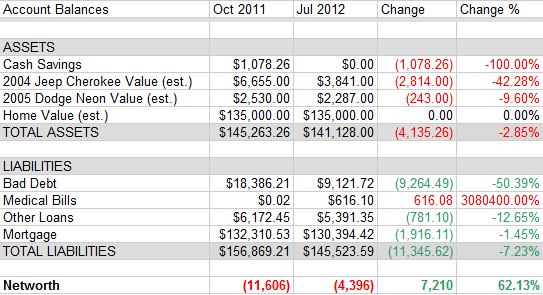 I was updating this net worth tracking spreadsheet last year and Oct 2011 was the last entry. I’ve updated the spreadsheet as of end of Jul 2012 and I’ve included Oct 2011 just as a reference to how far we’ve come in the past 9 months. Our assets have gone down in value but we’ve also paid off over $11k worth of liabilities for an overall improvement to our net worth of $7k since last Oct.
Jen and I have been married for three years. Each of us going through a divorce was catastrophic for our finances. I was actually working on the same program when Jen & I met… I had my baby emergency fund, I was working a second job and I was making progress on paying off debt. I explain that in order to put some context around the category of “Bad Debt” in the liabilities section above. Bad Debt is all of the debt from our previous marriages that had to be put on hold so we could restart our new life together. It’s hard to be too concerned about some credit cards when I have to pay alimony, for instance. Anyhoo, it’s all old credit cards and credit accounts that have gone to collections. We’ve made pretty good progress but we haven’t been gazelle intense. We eat out way more than we should. I’ve spent too much money on my tattoo and we make excuses for ourselves to spend money. Going forward, we’re going to be doing the Dave Ramsey baby steps. I’m embarrassed to admit that we don’t have any cash savings. If an emergency comes up, we have to let a bill go in order to deal with the emergency so obviously the very first step is to get our starter emergency fund together. I still have one more session to finish my tattoo and I really want an iPad for my birthday in August but I’m prepared to postpone both things. My short term goal is to have our $1k baby emergency fund and have a positive net worth by the end of the year. I’d be interested in comparing notes with other people in the same predicament or with people who have already made the journey.